A Lighter Version of the Best-Selling Hydrate Range! Providing a velvety soft finish! Pureology Packs have been put together to help you get the right products for your hair type. Stock up on your favourite Pureology shampoo and conditioner in a great value salon size! Protect your hair colour and perfect your style with Pureology Colour Fanatic. With a blend of Pureology's Antifade Complex, Fennel Seed extract and a blend of camelina, coconut and olive oil, the treatment boasts 21 benefits to keep hair in optimum condition. Pureology Hydrate Sheer is the lighter version of best-selling Hydrate Shampoo. Perfect for dry, fine hair, this gentle range has a concentrated, but lightweight, formula that cleanses hair and scalp, detangles knots and protects hair colour without feeling heavy on the hair. Pureology Hydrate contains advanced hydrating micro-emulsion technology. With the strengthening multi-weight proteins of Soy, Oat and Wheat, organic conditioning botanicals of Rose, Peppermint and Green Tea all combined together to hydrate, replenish and repair dry, colour-treated hair without compromising the lifetime of your haircolour. 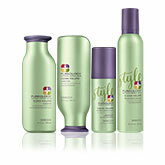 Indulge your hair in products such as Pureology Hydrate Pack. This range has been designed for use on any hair colour. Will bring out the blonde highlights and lighten your hair. All products are free of sulfates and salts, and instead use natural ingredients and botanicals, which all work to preserve your hair. Infused with natural oils and Pureology's exclusive AntiFade Complex®, Pureology Style + Protect will leave hair colour vibrant for longer whilst giving hair gorgeous shine and texture. Pureology Strength Cure provides repair for micro-scarred, sensitised, damaged colour-treated hair. Formulated with Pureology's exclusive Asta-Repair Complex, it contains Astaxanthin, a powerful antioxidant. The luxuriously creamy formulas help heal the hair whilst providing the optimum balance of strength and velvety softness. With no sulfates, parabens, or silicones that could weigh the hair down, this volumising range works gently to cleanse fine hair without stripping colour. Also 100% vegan, the weightless formula is enriched with Aloe water and soy proteins to add moisturise and shine. The Clean Volume system is ideal for those with colour-treated, fine hair, providing 24 hours of volume, for even the thinnest of hair. So wave farewell to lank and dull locks, your haircare saviour has arrived. For fine, flat hair in need of a volume boost, choose Fullfyl! Pureology Purify is a detoxifying treatment. Forming part of an essential colour-maintaining programme for your hair. Prevent colour oxidation and remove impurities with this ZeroSulfate® ultra gentle formula. Your hair is clarified without colour stripping. Odour, product build up, chlorine and damaging minerals found in hard water are nutralised. 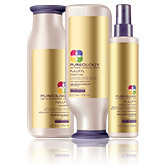 Pureology Pure Volume contains advanced volumising micro-emulsion technology. The strenthening multi-weight proteins of Soy, Oat and Wheat, combined with conditioning Organic botanicals of Lavender, Basil and Frankincense to boost, revive and repair fine, colour-treated hair. Smooth Perfection is designed to help fight frizz and create smooth, shiny hair. Using camellia oil and shea butter, this luxurious range is a must have for controlling your frizzy locks. Formulated for rough, dull and brittle colour-treated hair. Helping to retain your hair's natural shine and enhance fullness whilst protecting your hair's colour. View all Pureology Hair products in one place. No nasties care for colour-treated hair. Incepted in 2001, Californian brand Pureology is a professional haircare range unlike any other. Bringing ‘no nasties’ innovation to the haircare market, the brand have pioneered the way since their early 00s launch with the creation of their ZeroSulfate® shampoos and 100% vegan haircare ranges. Offering no compromise on colour, while still promising sustainably-sourced ingredients for their vegan formulations, the dual benefit Pureology Colour Care formulas keep hair colour vibrant for longer, while continuing to target other hair complaints such as frizz, dullness and brittleness too. A multi-benefit spray that helps to Prime, Protect & Perfect! If you're truly looking to create a vegan lifestyle you'll need to look beyond the kitchen cupboard and update your bathroom cabinet too! How Can I Prevent Hair Fall? Seasonal hair fall is very common, see how you can help prevent it. Money Back Guarantee: Pureology are so confident your colour will be protected and prolonged that they offer a Money Back Guarantee. If within 4 weeks of the date of purchase you have been exclusively using a Pureology product and you are not satisfied with the performance or the colour retaining results, you will be entitled to a full refund. Contact our Customer Services team for more information! Available in salon sizes so you need never go without your favourite haircare, Pureology’s range, including Pureology Shampoo, is also formulated with their innovative AntiFade Complex®, protecting hair against damaging UVA/UVB sunrays and full of antioxidants, making sure your colour maintains its vibrancy between salon visits. The highly concentrated product formulations also ensure you get more product for your pump, with up to 70+ shampoos from just one bottle. As well as cleansing your hair, you can keep a clean conscience too, as Pureology is committed to environmental sustainability. With packaging made from raw materials, the use of FDA-approved plastics and creation of 100% recyclable bottles, Pureology not only boosts your hair health but boasts uncompromised consumer safety too. With the range being 100% vegan too, you can rest easy that the products you’re using haven’t been tested on animals either. So whether your fine, flat hair needs a volume boost with Fullfyl, you’re seeking a moisture boost with Hydrate or simply need to tame the frizz with Smooth Perfection, Pureology’s dual benefit formulas have everything you need to maintain luscious locks and vibrant colour.